A slow growing, densely pyramidal shrub. 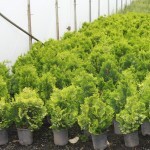 The foliage is bright yellow on the younger branches, maturing to deep green toward the interior of the plant. If planted in shade, the golden foliage will be lime green. It is easily grown in average soil as long as it is well-drained. Shelter from wind. This is a sport of 'Nana Gracilis'.